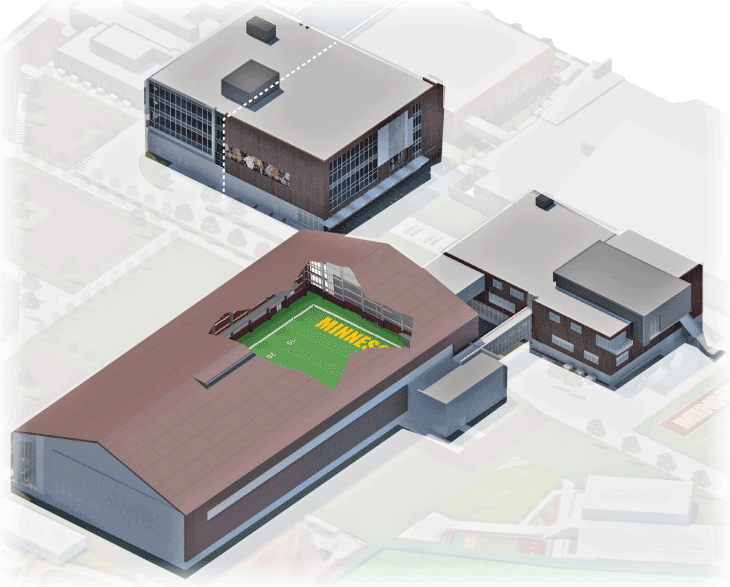 The University of Minnesota’s $166 million complex for the 750 student-athletes opens this month. They call it the Athletes Village, and it will rewrite the playbook on how Gophers practice, eat, train, study and go about their daily lives. Here is a quick glance at several key new pieces of the complex. Nutrition needs vary across an athletics department. Consider the difference between gymnastics and football, or even from lineman to quarterback. 1 Here, the Gophers will find unique menus built to their specific needs. There is seating for 325. The center is open to all University students and staff with a campus meal plan for breakfast and lunch, and just to the athletics department for dinner. The center also has an open test kitchen where athletes can take cooking classes. 1 The locker room, lounge and film study room are on this floor, along with 2 the practice court, which features a replica of the Williams Arena floor and about another half-court of additional space. 3 The north wall is almost entirely SageGlass, electrochromic glass that tints on demand. 4 Right off the practice court is the team’s new athletic medicine space. Richard Pitino and the rest of the men’s basketball staff have 1 glassed-in offices on this floor overlooking the team’s new practice court. The men’s basketball players’ lounge is here, too. This floor also features 2 the Lindahl Academic Center, available to all student athletes. The number of tutor spaces and quiet study rooms have increased from eight to 34. There is a new technology lab and “Gopher Getaway” academic lounge. 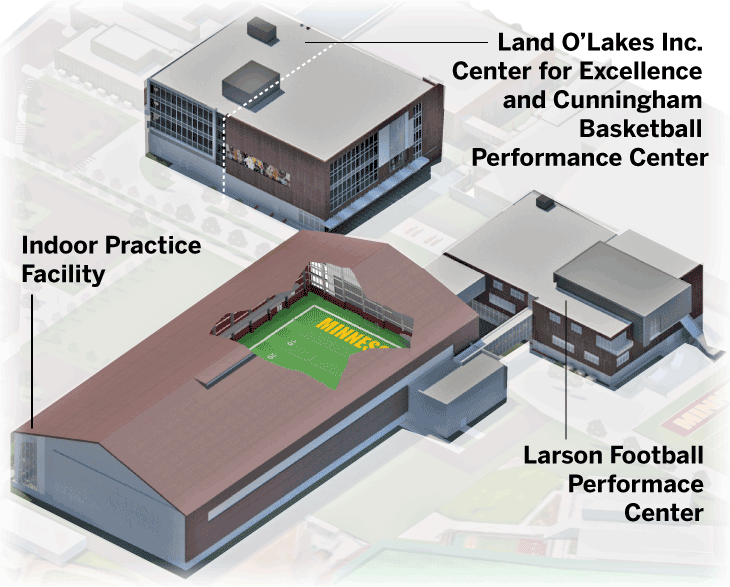 The graphics are unique to the Gophers women’s basketball team, but otherwise this is a square foot copy of the new men’s facilities. Both courts have sound-engineering designed to minimize the noise of basketballs dribbling through the rest of the facility. Each practice court has eight hoops, compared to the two at Williams Arena, where the women’s team practiced previously. Coach Marlene Stollings said this will greatly increase efficiency when the team practices free throws, for example, with one or two players at each basket compared to six. Stollings and her assistants have that same view as the men’s staff onto the practice court. This floor also features 1 the new Leadership Center, where the athletes can develop life skills and prepare for their careers outside of sports. The lobby has the building’s best views of the Minneapolis skyline, campus and the various Gophers competition venues. A signature element is 2 a touch-screen table just off the elevators that shows the millions of the job opportunities available in the Twin Cities, searchable by company or profession, with specific contact information. The weight room measures 16,000 square feet, which is about 10,000 more than the old one. This will allow all 120-plus players to lift at once, instead of splitting into groups. The first level also features 1 a new Gophers Football Hall of Fame, with multimedia graphics and a “game day” experience for visitors. 1 The open space hanging above the weight room’s north end is used for stretching, yoga and other low-impact training along with massage therapy and chiropractic treatment. 2 This level also features an observation walkway and the staff locker rooms. 1 The athletic medicine room has several hot/cold plunge tubs and underwater treadmills for injury recovery. 2 The football-shaped locker room features lockers with the pattern of the Minneapolis skyline stamped on its doors. The room’s lights help bring that design to life. From this level, the team can take a skyway into the new indoor practice facility. 1 The main football meeting room seats about 160 people. There are offices and other meeting rooms on this floor, along with the player lounge. A big window from the lounge allows people to look inside the new indoor practice facility and out to TCF Bank Stadium. Part of the lounge juts out from the rest of the Larson Center as a cantilever above the service road. The facilities for the women’s team and men’s team are very similar and stacked on top of each other in the Cunningham Center. For both programs, the facilities include the practice court, a locker room, lounge, a film room and specialized athletic medicine space. Marlene Stollings’ team was using multiple buildings to train. Now, they’ll have two floors to themselves. The floors are designed to keep noise (think a billion dribbled basketballs) from traveling up and down, and the windows include SageGlass that can tint on demand to let more or less natural light hit the floors. The weight room measures 16,000 square feet, which is about 10,000 more than the old one. This will allow all 120-plus players to lift at once, instead of splitting into groups. Offense and defense used to work out separately, for instance — not any more. The first level also features a new Gophers Football Hall of Fame, with multimedia graphics and a “game day” experience for visitors. The open space hanging above the weight room’s north end is used for stretching, yoga and other low-impact training along with massage therapy and chiropractic treatment. This level also features an observation walkway and the staff locker rooms. The University of Minnesota's $166 million complex for the 750 student-athletes opens this month. They call it Athletes Village, and it will rewrite the playbook on how Gophers athletes practice, eat, train, study and go about their daily lives. Here is a quick glance at several key new pieces of the complex. The Bruins needed performances from up and down their roster to outlast the Toronto Maples Leafs in yet another seven-game slugfest between the Original Six franchises. Iowa leads its best-of-five series against the Milwaukee Admirals 2-0.